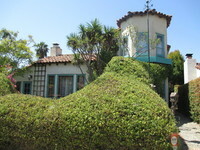 A group of dwellings originated by Louise Murphy Vhay, a wealthy woman from Michigan who moved to Santa Barbara in 1919. The residences are connected with many significant historical figures. J. J. Plunkett designed a studio here for himself, and another one for John Gamble, a California landscape artist who had done the murals for the Fox-Arlington Theater. 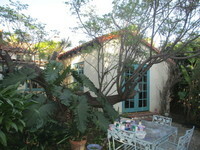 The Hollisters bought two studios as residences, and the houses were remodeled by celebrated architect Lutah Maria Riggs. 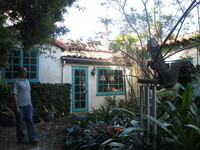 Other residents include illustrator Don Freeman, furniture designer Paul Tuttle, and artist William Hesthal. A Newspress article in 1959 called El Caserio Santa Barbara's version of Greenwich Village. A. Its character, interest or value as a significant part of the heritage of the City, the State or the Nation. Because the bungalows were owned and designed by many prominent members of the Santa Barbara community, the properties are significant to the heritage of the City. J. 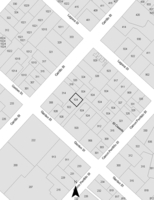 The property has the potential to yield significant information of archaeological interest because the site was previously owned by the Cordero's in the 1800s, and previously sited at least one large adobe structure as late as 1921.